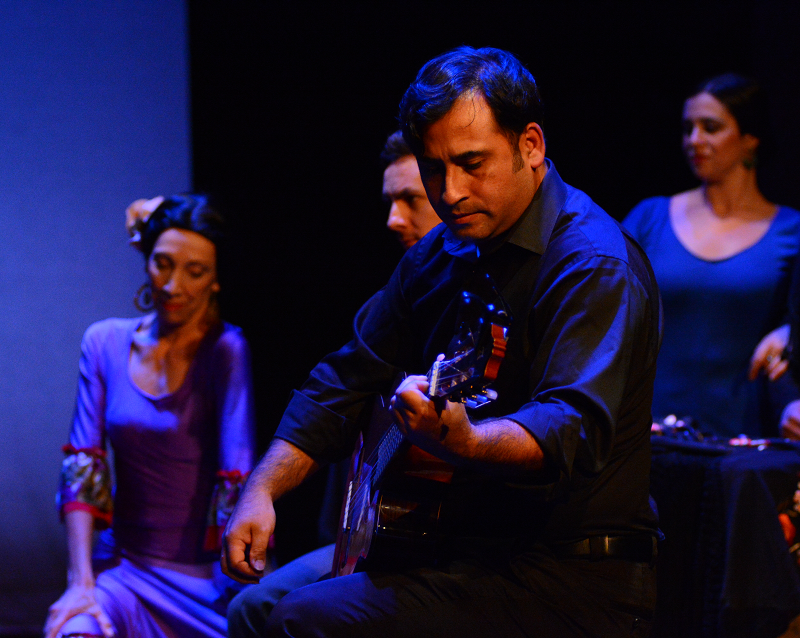 Patricio Zamorano performs a flamenco piece at Gala Theater. There’s the buzz of excitement and immediacy on the Tivoli Theatre stage. 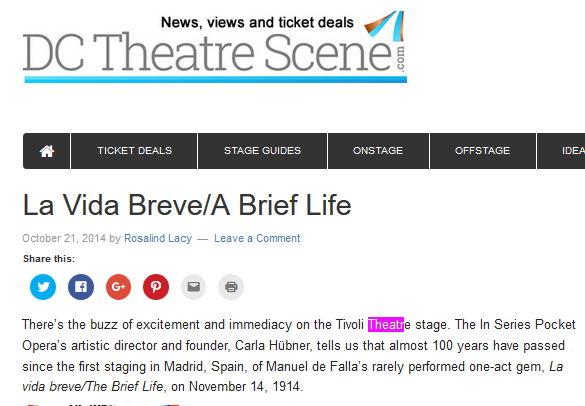 The In Series Pocket Opera’s artistic director and founder, Carla Hübner, tells us that almost 100 years have passed since the first staging in Madrid, Spain, of Manuel de Falla’s rarely performed one-act gem, La vida breve/The Brief Life, on November 14, 1914. It’s a tragic opera about an impassioned gypsy girl who loves too much and not well. But what’s refreshing and new is how the In Series Pocket Opera Company balances the tragedy by adding Viva Zarzuela!, A Curtain Raiser for the Opera, as an Act I warm up, with light-hearted songs from zarzuelas– the Spanish musical comedies. To the credit of director/choreographer Jaime Coronado, the dancing and singing from a mega-gifted cast, seem in-the-moment, as if improvised in a street cafe where singers and dancer come to relax. And music director, Carlos César Rodríguez, listed in the program as El Maestro, is the Orchestra. This flamboyant musician plays the grand piano like a virtuoso, at moments like a possessed demon, releasing the rip-tide tempo changes and atonality that hardly seem possible from a single keyboard. And throughout both acts, flamenco guitarist Patricio Zamorano’s spirited strumming adds the otherworldly duende-dimension– the deep and sad, soul sound of the flamenco. All eight selections for the curtain raiser, invite us into the opera. There are songs of frustrated yearning and unfulfilled love, even mockery and cynicism. Soprano Christine Soler and tenor Pablo Henrich-Lobo in “Paloma’s Song,” (the song of the pigeon), tell a story of a grounded dove, without a mate, who longs to fly in the sky but who can only coo. “The Burning Light,” rendered robustly with gorgeous gravitas by baritone José Sacín is a warning about predators, a seguidilla, a quick-two-step folkdance, (a genre made famous in Bizet’s Carmen) stamped with light-footed precision by Laura Quiroga. And bass-baritone Alex Alburqueque mixes in a welcoming spirit of naughty delight to “Mr. Hilarion’s Couplets,” with dancers Sara Herrera and Tsaitami Duchicela. The man-about-town is torn between two irresistible Madrid girls, but wonders: “….Do these girls love me only for my money?” And Nephi Sanchez, as Nestor, his ringing tenor voice paired with the mezzo-soprano with resonant chest tones, Patricia Portillo, as the African gypsy, elicited whistles and cheers on opening night. Their “Duet and Jota,” built with tricky tempos, key changes, and rippling intensity, represented two would-be lovers, arguing. In Act II we go rogue to the rough-shod countryside of Andalusia where working class characters hit the glass ceiling of the upper class. On stage, the adaptable flats, designed by Osbel Susman-Peña, have flipped sides to abstracted design, with earth-tones and bricks, of a small foundry mill town, lit by diffused azure lighting by Stefan Johnson. We are weighted with the brooding heat of the ancient, gypsy Arabic quarter of Granada, Spain. From the back of GALA’s Tivoli Theatre comes the cry that repeats like a unifying strophe: “Get on the job. Work we must!” as the foundry workers slowly parade down the aisles. And we feel surrounded by oppressive air where iron workers cast metal from molten iron. Director Jaime Coronado and the In Series Opera Company make De Falla’s La Vida Breve/A Brief Life glow with a surreal passion, intense as a blast furnace. Soprano Shaina Martinez, gifted with an exceptionally beautiful voice and mature understanding not often encountered, endows the young, gypsy girl, Salud with a touch of innocence that wrenches your heart. Salud, possessed with a will of iron, is passionately in love with an upper-class, wealthy Spaniard, Paco, sung by tenor Peter Burroughs. Yet Salud is doomed to suffer. Already, Paco, the deceiver, is committed to marry another woman in his own class. What’s profound to the point of dreamlike about the In Series interpretation, and makes it so worth experiencing is the tapestry of voices that weave in and out of the text organically. First come the tormented complaints from foundry workers about the sweltering work. Then add-in “Interludes,” are given an impassioned delivery by the narrator-character of the Poet, (Brian Shaw.) Garcia Lorca’s poems, Tree, tree,/dry and green, The Looming Moon, and Casidaof the weeping, (a Persian lament or elegy) are intoned center stage in English, but printed in Spanish in the program. The fusion of Lorca’s grotesque, sometimes frightening images and de Falla’s musicality seems apt. Both were friends, who worked together in the 1930’s to revive primitive music styles. The most exalting Interlude of all, however, is the exquisitely breathtaking instrumental “Interlude and Dance,” a popular piece often heard in contemporary concerts or on classical radio. You will recognize it when you hear it in the Act II wedding scene between Paco and his upper class bride, Carmela, enacted by Melissa Chávez. The grand celebration is tremendously ironic, with hand clapping, castanets, singing and explosive wails of “Olé ” Four hand-clapping, stamping dancers, with liquid, undulating arms, Alisa Bernstein, Sara Herrera, Laura Quiroga, Tsaitami Duchicela, decked out in swirling, abundant skirts, (costumes by Donna Breslin) take turns in the spotlight. Burroughs, the tenor, as Paco who jilts Salud received well-earned hisses at his curtain call, proving how wonderful he is in portraying stoic cruelty, as a Judas, a betrayer of innocent love. Much can be said about the way director Coronado uses the power of staging with tableau to create a memorable closing. Baritone Sacín as Sarvaor, the trumpeter of truth, who always sings of what is really going on, stands in ominous silence. As the lights fall, we catch our last glimpse of the angelic, protective uncle, now helpless. Standing in profile, ram-rod straight with dignity and grace, like a knife blade thrust to the heavens, Sarvaor personifies defiance that says more than any sung words. Sarvaor reminds us of the workers’ ominous refrain: “Damned if born with a yoke, And not with a hammer!” It’s a stunning close to De Falla’s La Vida Breve, an in-your-face confrontation with how romantic love is impossible in the modern, industrializing world at the turn of the 20th century. Performed in Spanish with English Surtitles. Directed and choreographed by Jaime Coronado with assistance from co-director Abel Lopez . Music Director & Pianist Carlos César Rodríguez . Produced by In Series Pocket Opera Company . Reviewed by Rosalind Lacy.